American entrepreneur Leslie Ann Bradshaw co-founded Los Angeles based creative interactive agency JESS3 in 2007. JESS3 is widely known for specializing in infographics, social media strategy, content creation, animation, digital PR creations and developing large-scale installations, branding and web design. In addition, the company has profound understanding and experience in developing data visualization. The Company’s clients’ list includes Google, Yahoo! Microsoft, Facebook, MySpace, Nike, Intel, NASA, Turner Broadcasting, Samsung and many more. Under Bradshaw’s leadership, the company has experienced a significant growth between the years of 2007 and 2011. Leslie Ann Bradshaw completed her B.A. as a Phi Beta Kappa graduate in 2004 from the University of Chicago, with economics, gender and anthropology as subjects. She started her career in communications and worked at National Journal, The McLaughlin Group and took up a media projects with C-SPAN. Later, while working on social media platforms, she discovered her passion in it; and in 2007, she co-founded JESS3 along with a New Zealand-American graphic designer Jesse Thomas. Currently, she serves the company as chief operations officer and president whereas Jesse Thomas serves as Chief Executive Officer. Bradshaw has been honored for several times for her contribution to JESS3 and entrepreneurial world. She has been called the “Most Influential Women in Technology 2011” by Fast Company, “Top Women in Tech Under 30” by The Wall Street Journal. She, along with Thomas was named “Tech Titan” by The Washingtonian Magazine and ‘The top 30 entrepreneurs under 30’ by Inc. magazine in 2011 and their company JESS3 was awarded a gold medal in 2012. 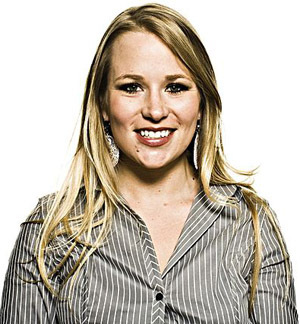 Bradshaw was also featured in the list of 44 “accomplished female founders” of Mashable.